The scheme consisted of the removal of track and existing ballast over a 11km stretch from Bangor to Holywood and its renewal along with a new drainage system. Work was subdivided into 4 separate phases. New long welded rail and sleepers were installed by the main rail contractor together with a new signal system over 19km from Belfast to Bangor. Phases 1 & 2 were completed using conventional earth moving plant. A single-track width of approximately 4m and restricted turning areas meant equipment had to travel up 500m at night both for excavating and stoning. Final grading was done with a Cat D4 dozer fitted with laser receivers. There was no direct access in phases 3 & 4 which meant we were forced to load into trains to remove soil and place stone using a ballast train. Excavation was carried out with conventional tracked excavators and again stone was placed using the laser dozer. A lieber A900 roadrailer excavator was on hand for initial spreading of the stone. Day time activities concentrated on organization and arrangements for the night activities. 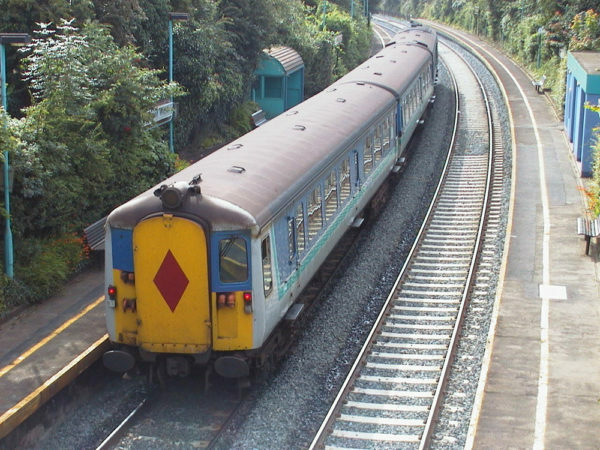 All work was subject to Translink railwork safety rules and required all personnel to be safety trained for railworks. The contract involved an extremely tight programme and limited access to the track. Storage areas remote from the track made work logistically complex. The majority of the works had to be carried out at night and at weekends to reduce conflict with rail traffic. Single line running of trains had to be maintained on a daily basis.